Jérôme Garcès will referee the Top 14 final between Montpellier and Castres at Stade de France on Saturday. It is the former fullback's second Top 14 final. It is one of rugby's grandest occasions. Winning the Bouclier de Brennus is a passport to much enjoyment for the winner and Stade de France will be full. Supporters at the match are at opposite ends of the field to prevent any clashes for it is an emotion-charged occasion. Out in the middle will be athletic Graces, whose previous final was in 2013 when Castres beat Toulon before 80 000 people. The year before Romain Poite had refereed the final. This year Garcès again follows Poite. Last year Clermont Auvergne beat Toulon in the final. This year neither is in the final. For Montpellier, it is their second final after losing to Toulouse in 2011. Castres have been in six finals, winning four of them. For 44-year-old Garcès, of course, it is a great honour to referee such a match. Not that he is a stranger to top matches. After all, he has been to two Rugby World Cups, has refereed Six Nations and Rugby Championship matches, plus over 50 matches in European Professional Club Rugby's top competitions including two Challenge Cup finals, Pro 14 matches and, of course, Top 14 matches including matches involving both of this year's finalists. For South Africans, he is well known as the referee in Brighton when Japan beat the Springboks and in the semifinal of the same World Cup when the Springboks and the All Blacks met. Then last year he was the referee at Newlands when rugby's greatest rivals met in a thrilling encounter. He has refereed Australia vs England at Twickenham and this year England vs Wales at Twickenham, a great rivalry that. In 2011 he had an unusual experience. He was on touch for Romain Poite in the oldest international of all, Scotland vs England for the Calcutta Cup, the world's oldest rugby trophy. 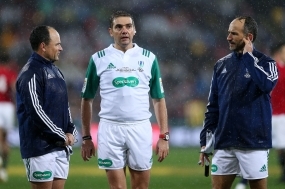 Poite was injured that day at Twickenham and Garcès took over from his compatriot to referee the match. Poite will be running the line at Stade de France on Saturday.